Water based acrylic Le Masque is a revolutionary decorative paint product used to produce the reverse effect of a stencil. Application: Tape stencil onto a previously sealed or varnished slick surface. 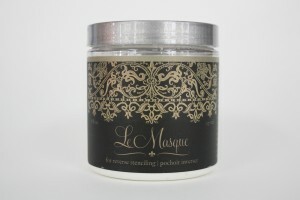 Gently spread a thick coat of Le Masque over stencil and remove stencil while Le Masque is wet. Let Le Masque dry until clear. Paint with Maison Blanche Furniture Paint and let dry. Carefully remove Le Masque to expose original surface. For enhanced durability finish with Maison Blanche Paint Company water based Varnishes or Antique Wax.